We wanted to take a moment to highlight a few of the women whose music will be premiered on Seattle Symphony concerts over the next year. If you haven’t yet heard the music of composers Anna Clyne, Helen Grime and Agata Zubel, you are in for a pleasant evening of listening. All three are highly successful composers whose bold, lyrical and dazzling music is the result of collaborations with orchestras in the United States and in Europe, including the Chicago Symphony Orchestra, the London Symphony Orchestra and the Royal Concertgebouw Orchestra. Seattle audiences may already be familiar with the music of Agata Zubel, who has appeared on programs by the Seattle Chamber Players. As we look ahead to premieres starting in June 2016, we’ve provided an essential listening guide so you can start to explore each composer’s music. Grammy-nominated composer Anna Clyne is the composer-in-residence with the Baltimore Symphony Orchestra this season. Prior to her appointment in Baltimore, Clyne was the composer-in-residence with the Chicago Symphony Orchestra from 2010 to 2015. Her “dazzlingly inventive” music often includes collaborations with choreographers, visual artists, film-makers and musicians and is inspired by her work in mixed-media and electronics. Seattle audiences will be the first in the United States to hear one of her newest symphonic works, This Midnight Hour, when Music Director Ludovic Morlot conducts the U.S. premiere with the Seattle Symphony June 9–11. One of her early orchestra works, Masquerade, was premiered by Marin Alsop at the BBC Proms in 2013. You can read an interview with Clyne from the Baltimore Symphony Orchestra and listen to a recording on her website. Below we’ve included a recording of her 2012 orchestral work, Night Ferry, which was premiered by the Chicago Symphony Orchestra. For more information and to listen to additional recordings, visit her website. Scottish composer Helen Grime is an accomplished performer. Her oboe concerto, which she performed herself at the premiere, established her as a lyrical, bold and distinctive voice. She has been commissioned by the London Symphony Orchestra, the BBC Proms and the Tanglewood Music Center. Seattle audiences can hear the U.S. premiere of a new composition in June 2017 with Principal Guest Conductor Thomas Dausgaard conducting the Seattle Symphony. Described as contemporary music’s “multiple threat” by The New York Times, Agata Zubel is a composer, singer, percussionist and violinist. When she comes to Seattle in October, Music Director Ludovic Morlot will conduct a world premiere of a new composition by Zubel on October 27 and 29. On October 28, Zubel will premiere one of her own compositions on the Symphony’s [untitled] series in addition to performing music by the Polish composer Witold Lutosławski. Who are your favorite women composers writing music today? We would love to know who inspires you! Share your thoughts with us on Facebook and Twitter. You can hear music by Anne Clyne at the Seattle Symphony on June 9–11, 2016. 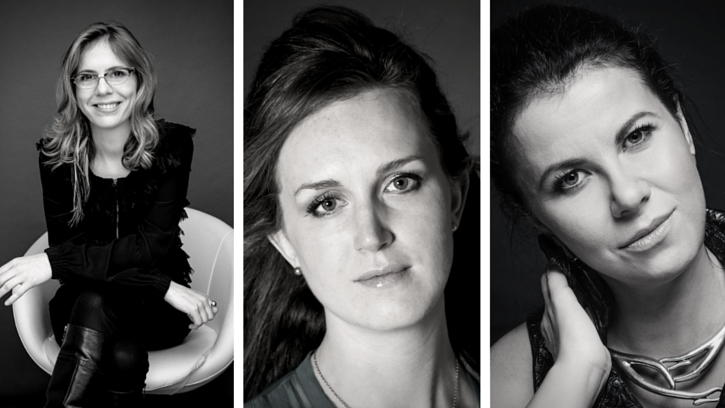 Subscribe now for our 2016–2017 season to hear the music of Helen Grime and Agata Zubel.